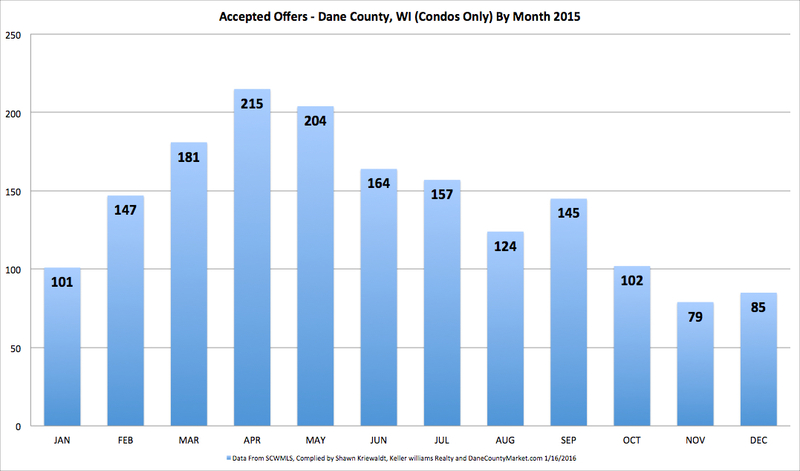 Accepted Offer Data – Dane county, WI. 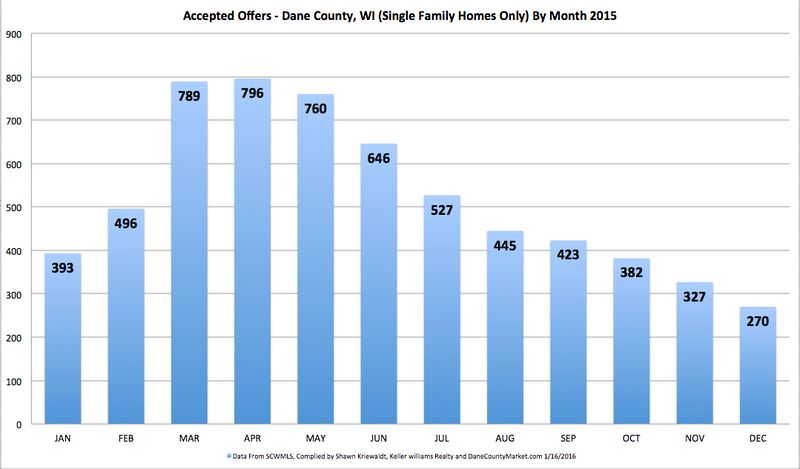 The shape of the graph is very similar year over year (this graph is from 2015) with the most accepted offers for Single Family Homes and Condos occurring in April, with March and May usually competing for second place. Except for the year of the first-time buyer credit (several years ago), these graphs looks almost identical year after year. Historically speaking, this year will likely be no different… To expose your property to the most buyers, we suggest that you have your listing in place near the beginning of March. Should you or do you need to list only in March, April or May? Absolutely not! The graph shows us that properties sell all-year-long, just not as many in certain months. AN IMPORTANT CAVEAT: There are not as many properties listed at other times of the year, so if you are listed in the slower months you will be competing with fewer properties and typically speaking, the buyers that are out in the cold and snow or during the holidays are typically more motivated to buy. If you would like a peek at our Home Selling Plan, click here. How Can I Tell If A Listed Property Has An Accepted Offer? Most sites, especially the national sites do not display the locked MLS data. Fortunately this site does! To See If The Property You Are Interested In Purchasing Has An Accepted Offer Click Here. Want to chat? Call me at 608.212.5743 for a free consultation and market analysis today or complete the form below.